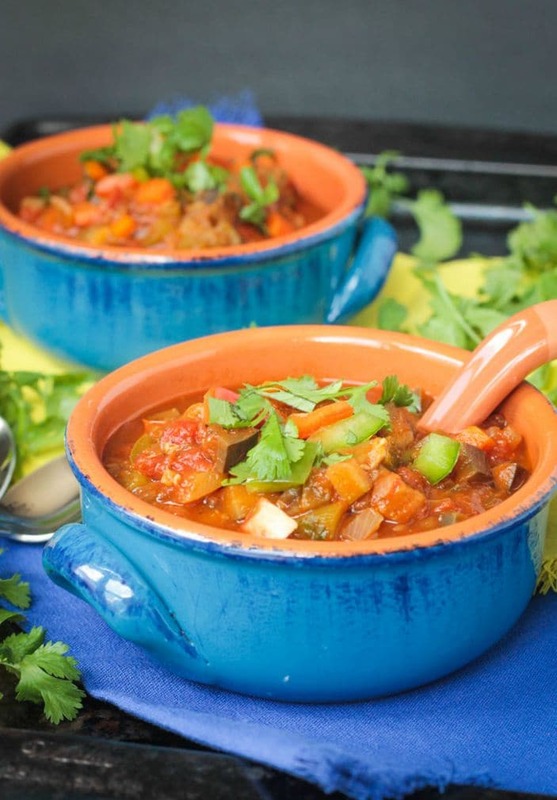 Spicy Vegan Chili – all veggies, no beans, that takes advantage of your garden’s bounty! With all this rain we’ve been having in the midwest, our garden is thriving! I’m not exaggerating when I say I’ve only watered it myself twice this entire summer. It’s a garden that basically takes care of itself! How awesome is that? Ok, I’ve definitely done my fair share of weed pulling, but not having to drag the hose out every day has been great. 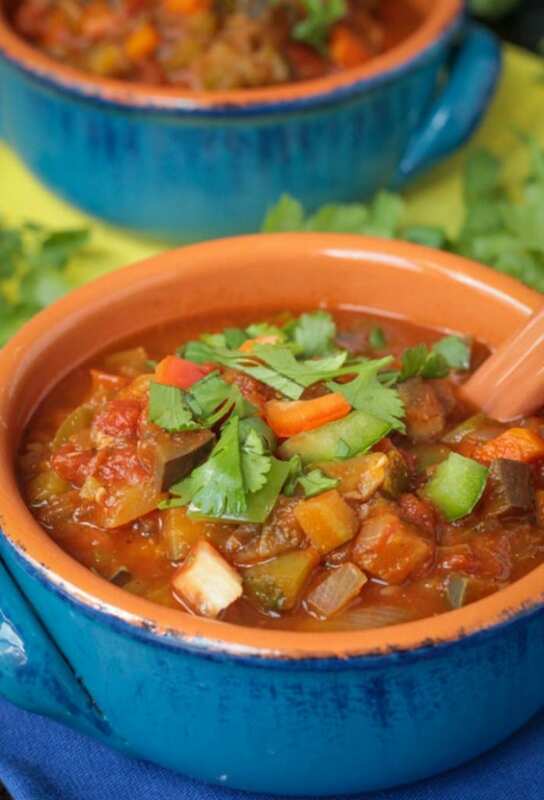 This spicy vegan chili recipe takes full advantage of the summer garden bounty. And, if you’re not a fan of beans, then this recipe is especially for you! Introducing Spicy Beanless Garden Vegan Chili!! I’m gonna let you in on a little secret. When I set out to make this recipe, I didn’t intend for it to be beanless. I was actually going to add black beans and kidney beans, but trying to make a recipe with 3 kids circling around sometimes sends my brain into malfunction mode. Please tell me I’m not the only one with this problem! It wasn’t until I was serving it for dinner that I realized my oversight. It happened to be a worthwhile mistake because my hubby isn’t the biggest fan of beans. He tolerates them because I use them almost daily (love you, honey! ), and is actually learning to like them in certain things like veggie burgers, dips and sauces, but he still prefers food withOUT the beans. He was thankful that this spicy vegan chili was all veggies. I know my hubby is not the only one out there that isn’t in love with beans, right? So, if you fall into this category, you must give this dish a try! 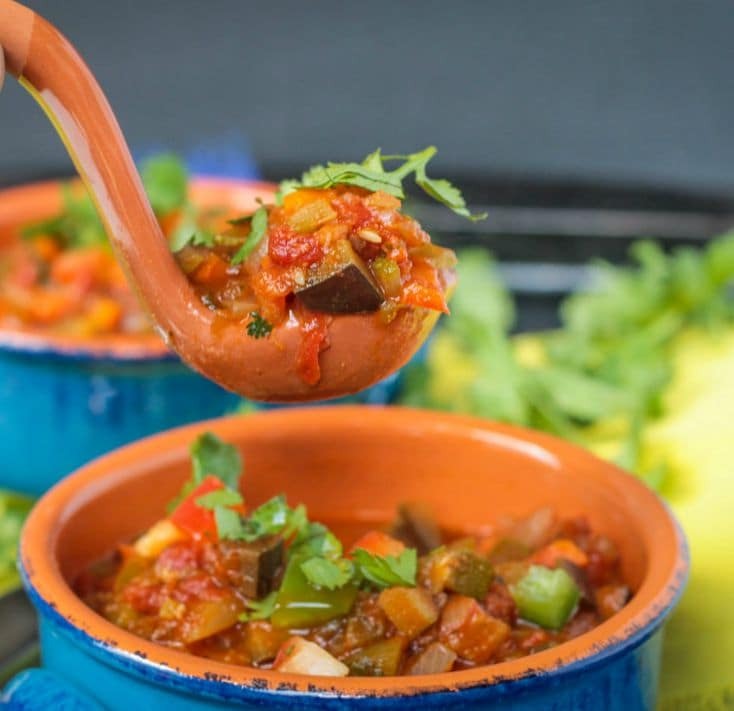 This spicy vegan chili is chunky and “meaty” from the eggplant and zucchini, plus it’s loaded up with flavor from the onion, sweet peppers, hot peppers and fresh herbs. So, if you do love beans, you can add them if you want to, but I don’t think you will miss them. I don’t actually grow carrots in my garden, but you certainly could, and I love the slight sweetness they add to the chili. I hope you give this garden fresh chili a try!! When you do, come back and leave me a comment below to let me know what you thought! You can also tag me #veggieinspired and @veggie_inspired on Instagram or Twitter. 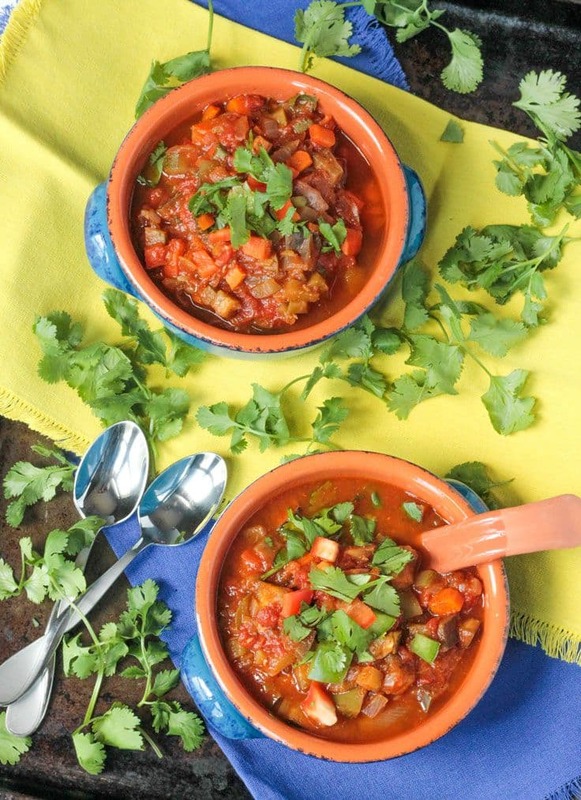 A spicy beanless vegan chili that takes full advantage of your summer garden bounty! In a big soup pot over medium heat, sauté the onion in 2 tbsp vegetable broth for about 3-4 minutes until it starts to soften. Add the garlic, carrots, green and red bell peppers, banana pepper and jalapeño pepper and sauté 5 minutes until they start to soften. Add another 1-2 tbsp veggie broth if needed. Add the zucchini, eggplant, all spices and herbs, diced tomatoes and 3 cups vegetable broth. Bring to a simmer and continue simmering for 15 minutes. Taste and add salt/pepper as needed and adjust any other seasonings to your preference. Add the liquid smoke, if using. Simmer for another 5 minutes. Serve hot garnished with more fresh cilantro, chopped raw onion or bell pepper. ~If you like things really spicy, you can leave in the ribs and seeds from the hot peppers. ~If you like things less spicy, you can leave out the jalapeño or banana pepper or both. ~And if you really can't imagine chili without beans, then by all means, add a can or two of your favorite kind! DELICIOUS! Made it tonight without the eggplant. I might add potato instead next time because I normally don’t have eggplant, HOWEVER it was delicious without. I served over rice for some and over riced cauliflower for others. The jalapeno and banana pepper were from a jar tonight, and added on top of those that wanted the spice. And I did also add the fresh cilantro on top. Note to self: To make a little thicker/less brothy, take out a small portion, blend, and add back into the soup. This is a keeper 🙂 Thank you! Wonderful, Stacy! So happy to hear you love it. And I’m glad that you were able to make it your own! How would you can this chili does it have to be pressured or water bath. Hi, Florence. I’ve never canned anything so I’m afraid I can’t give you instructions on that. Sorry. Jenn this recipe is amazing! I’ve also made a variation which I like to do as I’m not a big fan of carrots. I remove the eggplant, carrots and vegetable broth out of the recipe and instead I put in one pack of veggie ground and double up on the zucchini. I also add chili flakes. It’s amazing, give a shot one day! This chili was so appetizing as it was filled with bright green, red, & orange vegetables. I served chili over brown rice to a receptive non vegetarian guest. The chili tasted wonderful & will be a favorite dish that will be prepared often. I liked the fact that there would be leftovers to simply reheat. I did use 1 1/2 Tbs. Balsamic vinegar at the end because I use a limited amt. of salt & enjoy a sweet flavor. I sprinkled black pepper on my bowl to give it a kick. Thank you, Dianna! Love the idea of drizzling some balsamic to finish. I do that with a lot of soup, but never thought to add it to chili. I’m totally trying that next time! So happy to hear you all loved it! This looks great but if it doesn’t have meat or beans it’s not chili. This is a spicy vegetable soup. According to Webster Dictionary Chili is defined as “a thick sauce made from meat and chilies. Also: a similar dish made without beef; vegetarian chili.” Have a great week! Great recipe, made this tonight. Just a quick note, the recipe doesn’t actually say when to add the tomatoes! As the pot was simmering, I was tidying up and noticed the unused can of tomatoes. Not a big deal or anything, just thought I’d mention it. Oh gosh, thank you so much for bringing that to my attention. I’ll change it now. So glad you liked the recipe. Thank you, Casey! Hmm… never thought of a bean less chili but I like it! Chili is one of my favorite foods and also one of the only one I can never get it right 🙁 I should follow your recipe instructions since your recipe looks yummy and healthy. As a kid I never liked beans in my chili. Nowadays, my chili is made up of mostly beans, but I know there are some out there that still feel the same way about beans as I did as a kid. And this turned out so great that you won’t miss them at all! Let me know if you try it! Mmmmmmm love a good chili, and love this beanless veggie PACKED version! Thanks, Steph! It’s so good! Hi, Michelle! Thanks! Veggies have protein, too, so no worries. I hope you love it! Thanks so much, Krystallia! Have a wonderful weekend! Oh this looks fantastic! I can even use the tomatoes from my garden in place of the diced tomatoes. I have quite he bounty right now. Yes, absolutely!! Fresh tomatoes would be amazing. Mine were all still green when I made this…our cherry tomatoes are finally starting to turn red, but our big ones are STILL green! Please let me know how it turns out for you! Have a great weekend! I’m a lover a beans, but in the summertime I think a bean-ful chili would be too heavy. I love how you made a tasty chili recipe that celebrates the flavors of your summer garden instead… even if it was by accident (I have the same kid/chaos problem)! LOL, I’m glad I’m not the only one! Thanks, Rachel! This is perfect! Such a delicious blend of all my favorite veggies! Thanks, Lucie! Thank goodness for my garden! LOL, Natalie! The bowls are from Home Goods and were pretty cheap. 🙂 I do love them! This sounds delicious Jenn! I’m LOVING all the veggies in here and especially the peppers! Wow, the most amazing veggie chili ever! So healthy and with all these veggies, I’m sure I wouldn’t miss the beans either! Looks so comforting girl and I’m so envious…wish I had a garden!! I’m thinking this would go good with one of my stuffed sweet potatoes! YUM!! The colors in this dish are just incredible and I love all of the veggies you’ve included! 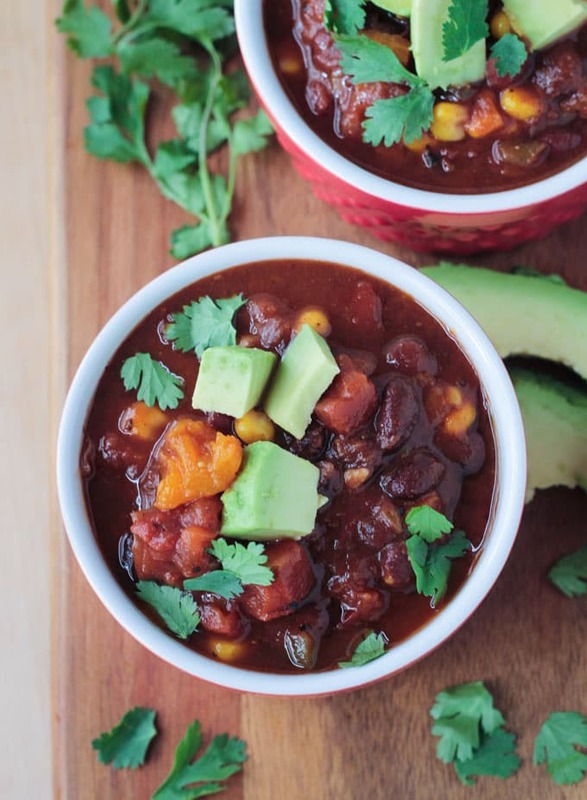 It’s been ages since I had a great veggie chili and now I’m totally craving a giant bowl! Thanks, Kathleen! Veggie chili is the best! Thanks, Sina! I usually add beans too, but I didn’t miss them in this recipe. Please let me know how it turns out for you! This chili is perfect for summer. It’s nice and light, and the veggies are so healthy. 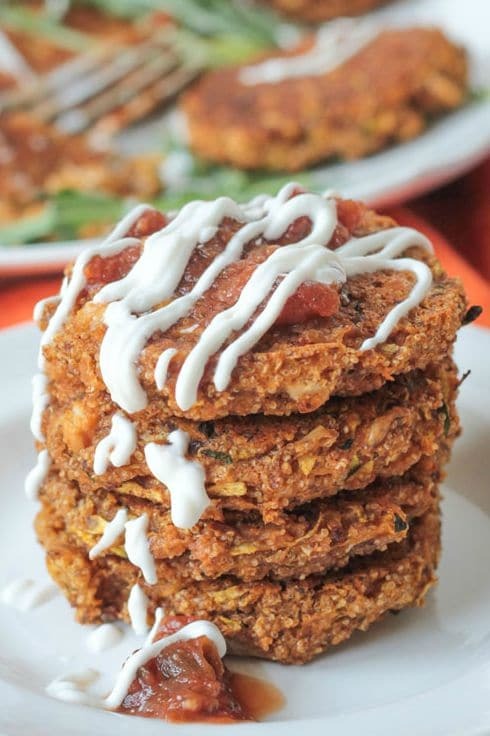 I’m going to go pick some zucchini and make some this weekend. Yes, Linda, the past week has been great! We’ve been to the pool 4 times in the last week alone! BUT, there is more rain in the forecast for all next week. Ugh! Glad you like the chili recipe. Please let me know if you make it!